A club day out to watch some footy together and help the effort to internationalise football in Japan! 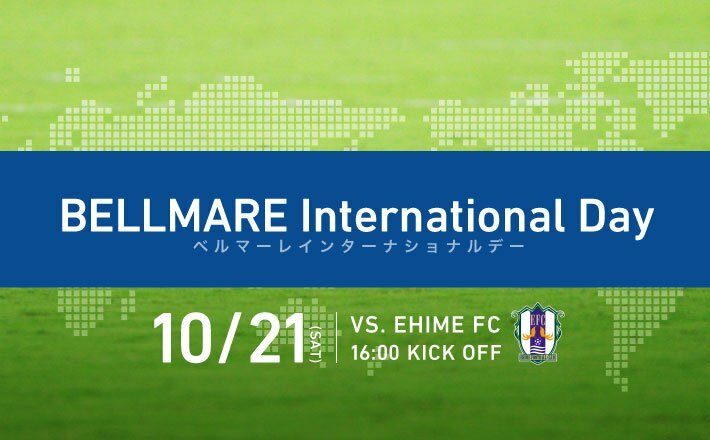 Shonan Bellmare got in touch with us at BEFC to tell us about their International Day on October 21st. Their purpose is to introduce non-Japanese to the football club and internationalise the club. On International Day tickets are half price to non-Japanese but also to Japanese too if they come with international friends. Well since BEFC is extremely international and there are no TML matches that weekend, it might be fun to head on down to watch a J2 match and support a club promoting the right mindset! Shonan Bellmare are currently first in J2 and will be playing Ehime FC who sit at 16th. Tickets can be bought online in advance or at the stadium. If we have a large enough group we can see about doing it all in advance. Quite a few members have said it would be fun to all go to a match together, and the Ladies Team have done this already. While Shonan Bellmare might be further than a central Tokyo team it is only 1 hour on the Shonan/Shinjuku line from Shibuya, which is less effort for most of us going to play in Saitama and SOGA. Attached is a PDF from Shonan Bellmare about the event. Basically adult tickets are ¥1,500 and youth tickets ¥500. While it is possible for anyone to join at anytime, if we treat it as a normal event and sign up by the Wednesday before we can look at buying the tickets in advance as a group, and if we have plenty of members we can let Shonan Bellmare know we are coming as they are also open to ideas about how BEFC and Shonan Bellmare could work together promoting internationalisation and participation in football.